Anyway, to make a long story even longer, I enjoyed the look and feel of the notebook. It looks super professional, and the hard, durable cover means it can survive many shoves into a briefcase and accidental drops from great heights. Each page has a little line for the date and the Arc logo at the bottom, which made me feel as if I was an archivist for some kind of Staples-related cult. The paper had a nice weight and feel and was perforated, which came in handy when someone asked me if they could have a sheet of paper. 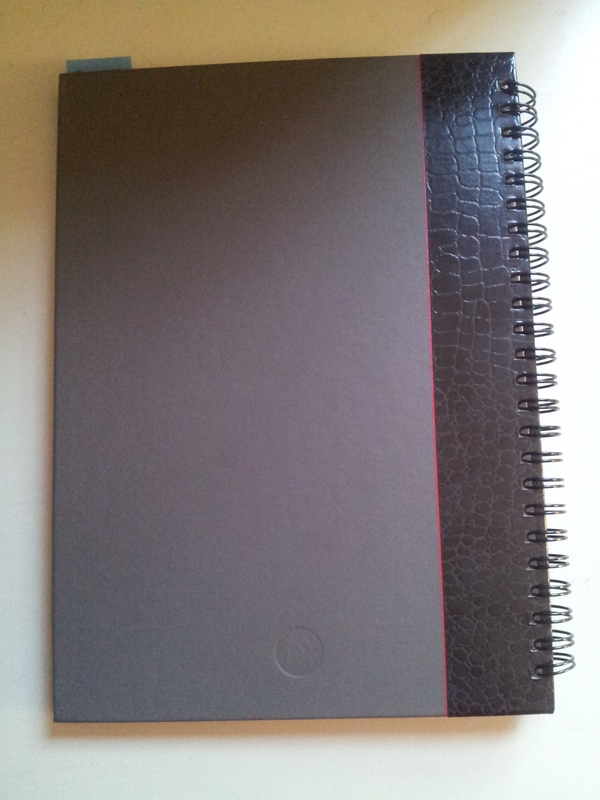 This notebook thankfully was spiral bound with a tough coil that did not come loose from the covers. The only downside to the notebook was that it had too few pages, so I got through it in a little over a month. But if I could somehow find it, I would highly recommend it as a notebook to use at work to take notes at meetings, not necessarily as a personal journal, which was what I used it for. 9/26/16 to 11/6/16. This is the back; front is covered with a large political sticker.